Hearing of my unfortunate incident at the chopping board earlier, this kindly little fellow decided to make me a packed lunch. How kind! I wonder what goodies could possibly be inside this tightly packed bundle. hmm, it appears to be, errrr, a slightly digested housefly. Oh. Hmmm. I think I’ll pass. Thanks for the thought though, little fella. Scaryness: 4. 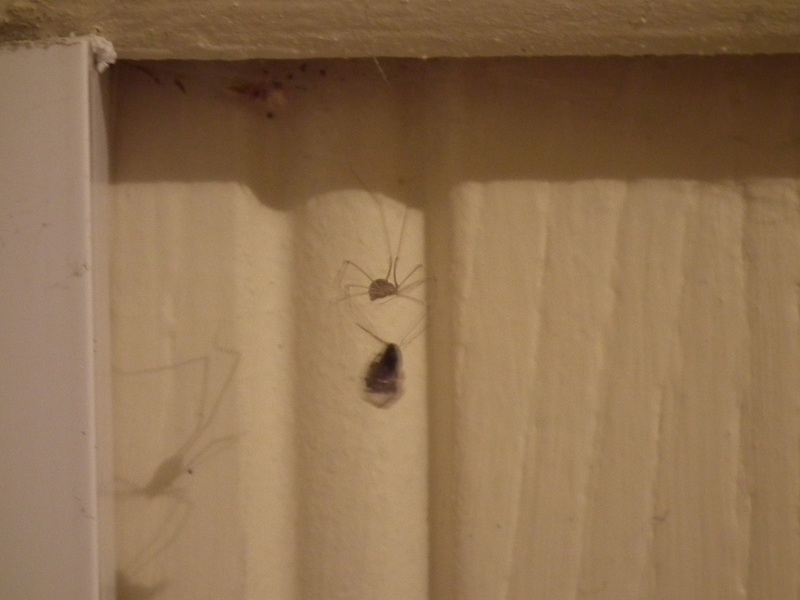 As small and almost cute as this one is, there’s something rather macabre about watching a spider wrapping up it’s prey. Maybe it’s the way it turns it round with two of it’s legs, spinning the silk over it’s corpse. Like a grandmother knitting some woolly mittens for the grandchild she’s just poisoned with her out of date malted milk biscuits. While watching Songs of Praise. The Aled Jones of spiders.